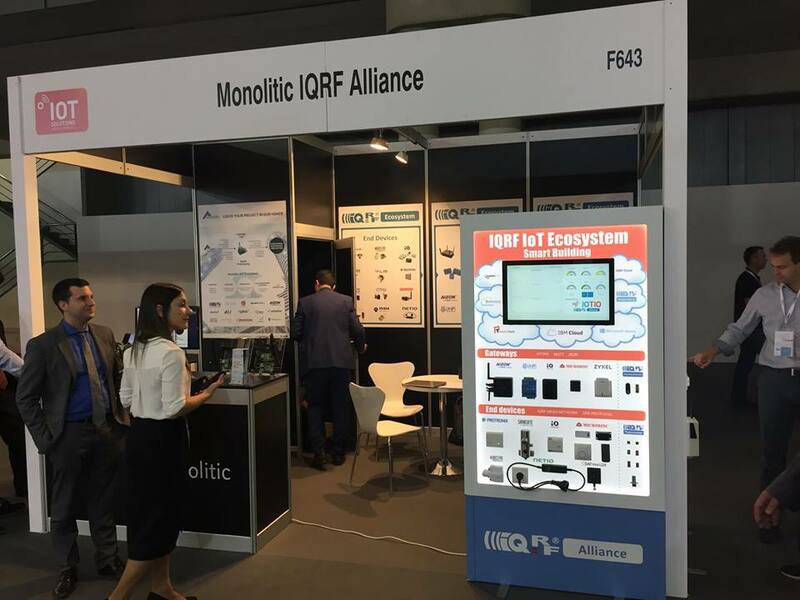 The IQRF Alliance attended the IOTSWC18 event in Barcelona together with Monolitic with a success among visitors. Presenting members‘ devices and solutions. The IoT Solutions World Congress is an event full of decision makers, top speakers, and business professionals. The event is dedicated to joining IoT providers with industry in order to help agree on business partnerships. This year was the fourth IOTSWC and it was visited by more than 16,000 people, 300 exhibitors, and 316 top level speakers on a venue of 32,000 m2 large. 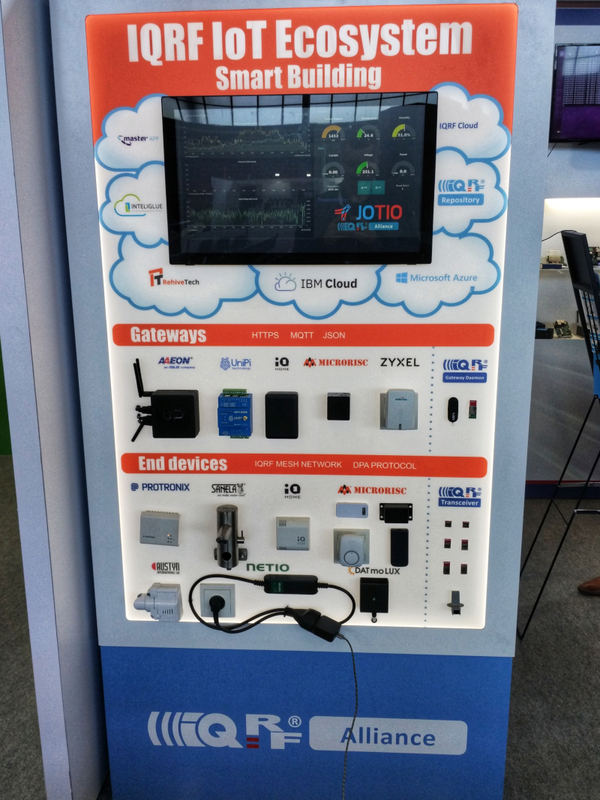 The IQRF Alliance had a joint booth with Monolitic, M2M communication, and semiconductor company, and presented members’ devices and solutions using live demo boards with end devices, gateways and also data visualization in various clouds. Next IOTSWC is on October 29-31 2019. This entry was posted in General on 23.10.2018 by Jan Pešl. 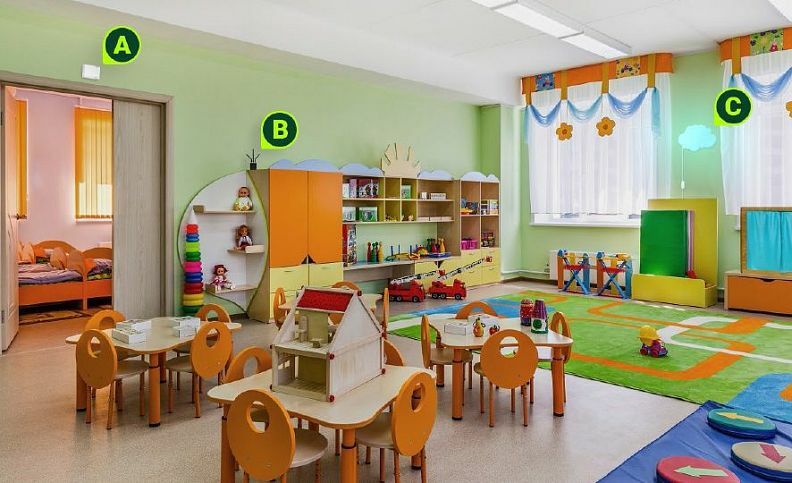 RehiveTech, a spin-off of the Brno Technical University and member of the IQRF Alliance, installed its smart indoor air quality monitoring system in several schools and kindergartens in Brno, and the results were very interesting. At the beginning of the project, an analysis of the environment has shown that CO2 levels in rooms are gradually increasing, a phenomenon that is common in every room inhabited by people and not ventilated properly. Unfortunately, higher levels of this gas cause drowsiness, headache, and a lack of concentration. In their own interest, people should watch the level of CO2 that should not exceed the 1500 ppm hygienic limit set by a decree. The deployed system consisted of a CO2 sensor (A) that provided data via the IoT system (B) to the central application where the data was evaluated. The control commands were regularly sent back, influencing the color of the light, which was in the form of a likable cloud (C) present in a class. The light signalized how healthy the environment was by changing colors. Children and staff have instructions on how to behave in any color state. They learned how to maintain the CO2 level low by only proper ventilation. Three months later, the experimental shutdown of the signaling light followed, and the measurements surprisingly showed that the local staff had learned to control their indoor air themselves and that no unacceptably high levels of CO2 were measured. The system can also recommend or not to open windows based on a weather forecast or ambient air data. RehiveTech, a member of IQRF Alliance, develops this system for offices where within a single AuroraHub system it is possible not only to measure the air quality but also to solve the security of rooms, attendance, and mandatory staff breaks, e.g. with smart bracelets including the necessary documentation. More at www.aurorahub.io. The IQRF Meetup is over but the IQRF Alliance is working on other events for its members. Meanwhile you can go through all the presentations from the Meetup. Also, you can view the photos from the IQRF Meetup in Mikulov here. Contacts of all registered guests are in the internal news in Member zone where only IQRF Alliance members have access to or contact jan.pesl@iqrf.org for the list. 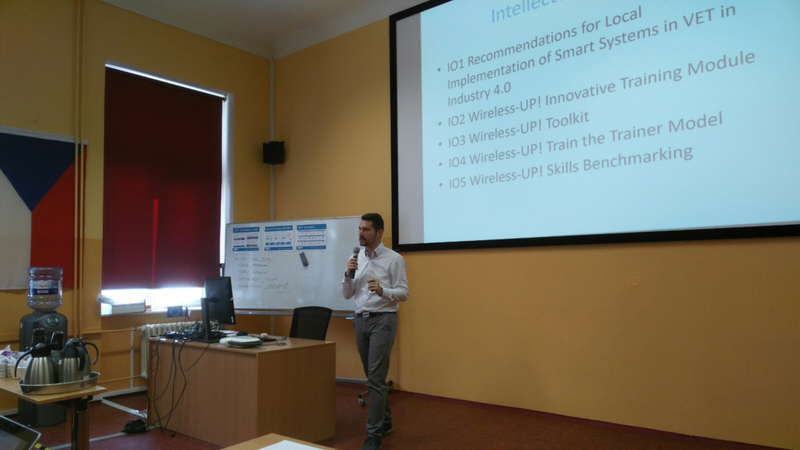 More than 90 IoT professionals came to the IQRF Meetup in South Moravian region. The IQRF Meetup became very popular among the members of the IQRF Alliance during the years. This time the meetup was attended by more than 90 representatives not only from companies that are members of the Alliance but also from companies that for example heard about the IQRF wireless technology for the first time but are interested in it. 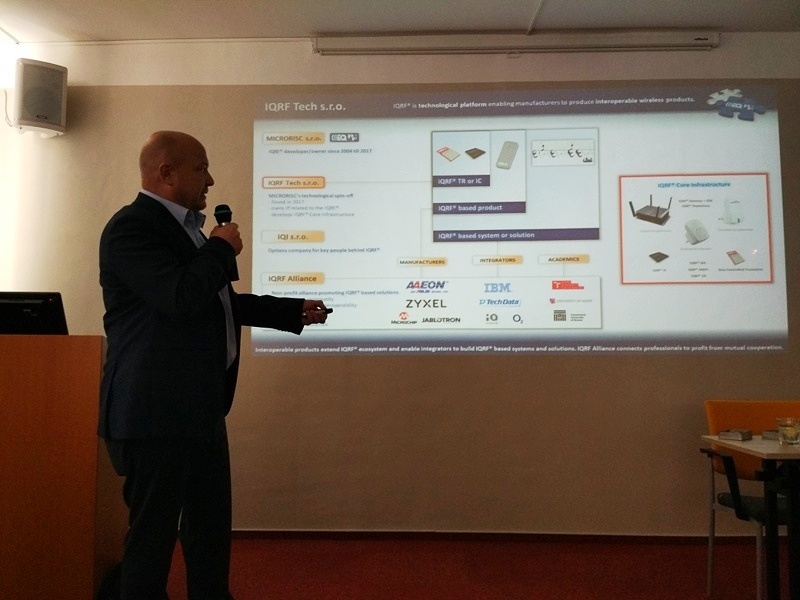 The event was held in Hotel Volarik in town Mikulov, South Moravian Region (CZ) and started with two blocks of presentations where the IQRF team introduced new features (Smart Connect, IQRF Network Manager mobile app, IQRF Daemon 2, etc. ), devices (GWs, etc.) and also vision where should the IQRF technology be heading. The second block was dedicated for representatives from various companies all over the Europe who had time to introduce their company, what they do, what they can offer to others and what they need from the community. Based on the experiences from previous years, we know that it is all about networking. The best networking is of course done while eating and drinking something tasty, so the whole group moved to the nearby wine cellar. Attendees enjoyed the wine degustation and started to discuss possible cooperation with companies they didn’t even know a few hours ago. The IQRF Meetup is coming, set a note in your calendar! 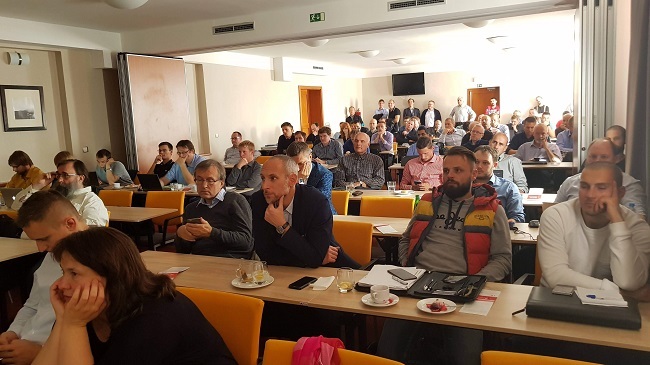 The IQRF Alliance invites you to another IQRF Meetup which will be held on October 4th, 2018 – now in South Moravia. 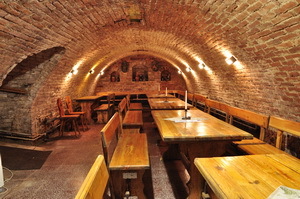 Attendants will be able to enjoy an informal conference on professional premises and then move to a wine cellar for a good networking dinner. The IQRF Meetup will start with a Registration from 12:00 in Hotel Volarik, Mikulov, Czech Republic. After the Registration, there will be two rounds of presentations – representatives will have an opportunity to briefly introduce their company and what they do. IQRF Tech and other IQRF Alliance members will introduce the release of new features, products, and services: Smart Connect, IQRF Gateway Daemon 2, simple and low-cost IQRF gateway, mobile app, IoT platform, connectivity to Big Clown makers kit, and much more. Thanks to the experience we know that people get to know each other best during networking, so we will take a short walk from Hotel Volarik through the historic center of the town to the wine cellar Šimák. Guests will find there a pleasant sitting with a wine degustation and a good dinner in the form of pork ribs and chicken wings. Furthermore, we will try out the very first IQRF music jam so bring any musical instrument you can play to join the “IQRF band”. We recommend Hotel Volarik for the accommodation, where the whole IQRF team will stay as well. The accommodation is registered by the guests themselves. Please book your room at info@hotelvolarik.cz or call +420 777 003 692. This entry was posted in General on 13.8.2018 by Jan Pešl. Check out the new case study on www.iqrfalliance.org. This case study shows how reliable the IQRF wireless technology is. 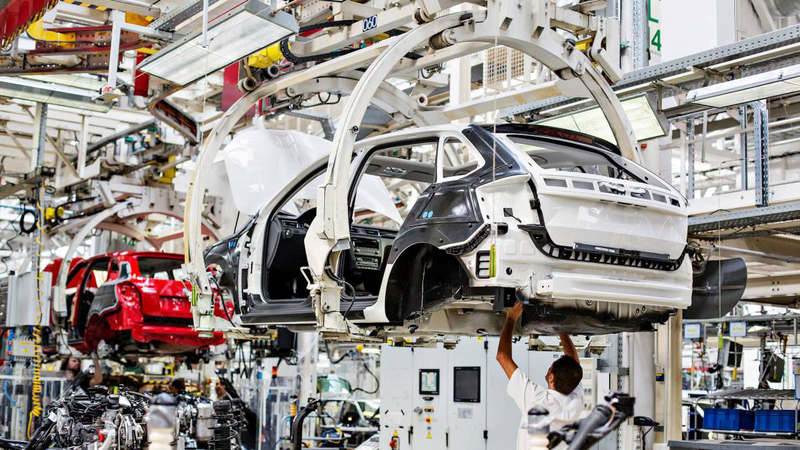 Over 8 years of operation in the production hall of Skoda Auto without any problems whilst saving costs for cabling. This entry was posted in General on 3.8.2018 by Jan Pešl. IQRF technology was presented to 24 teachers who would like to include it in their teaching. They got theoretical as well as practical training, with many useful examples of IQRF technology using. 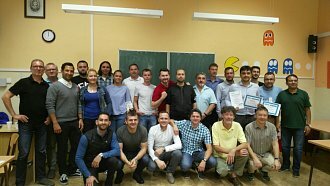 Project partners are: Elektrotehnička škola Zagreb (HR), Obrtničko učilište (HR), ŠC Krško-Sevnica (SI), Berufsschule N1 (DE), Smíchovská SPŠ (CZ) and AKÜ – Afyon Kocatepe Üniversitesi, Bolvadin Vocational School (TR). 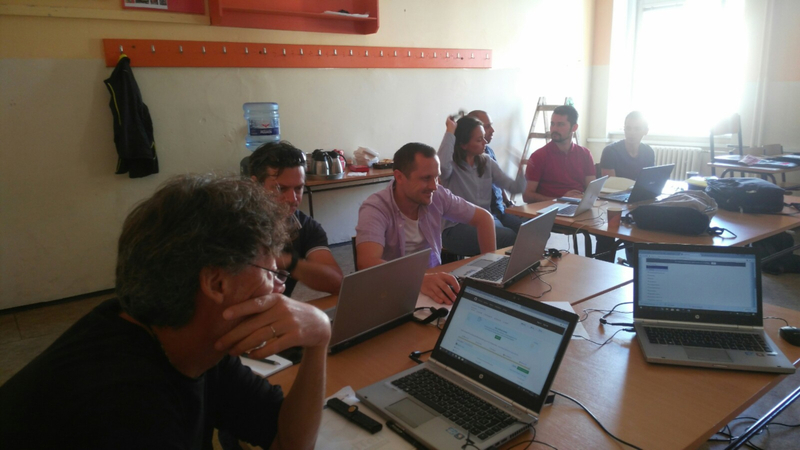 The goal of the project is to implement wireless communication between sensorial technologies within existing VET curricula for smart and sustainable housing and industry. All teachers got an IQRF Basics Instructor certificate so they are allowed to certify their students for this technology. We are pleased we could help them understand IQRF basics and we are looking forward to a new curriculum with IQRF wireless technology. This entry was posted in General on 13.7.2018 by Jan Pešl. The IQRF Alliance brought a live demo board with members‘ products to IoT Tech Expo Europe 2018 in Amsterdam. This is Europe’s largest and leading IoT event. 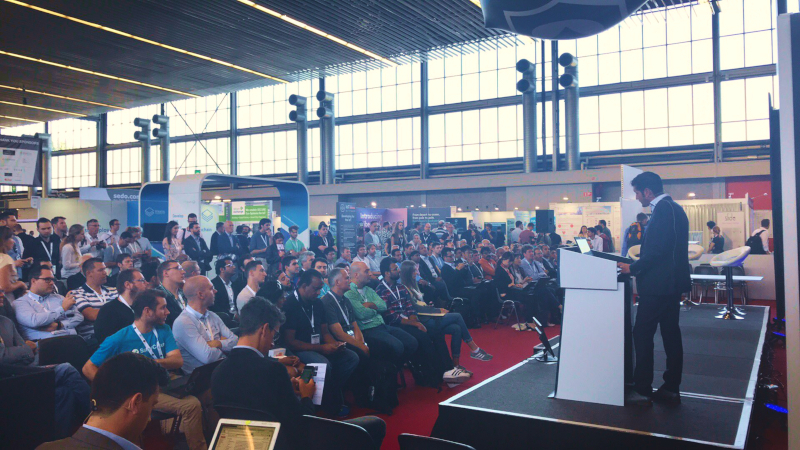 IoT Tech Expo Europe 2018 was a two-day event visited by the leading companies in IoT, IoT professionals and overall more than 8000 attendees. Visitors could learn the latest innovations in an IoT area thanks to over 300 speakers and also from more than 300 exhibitors. 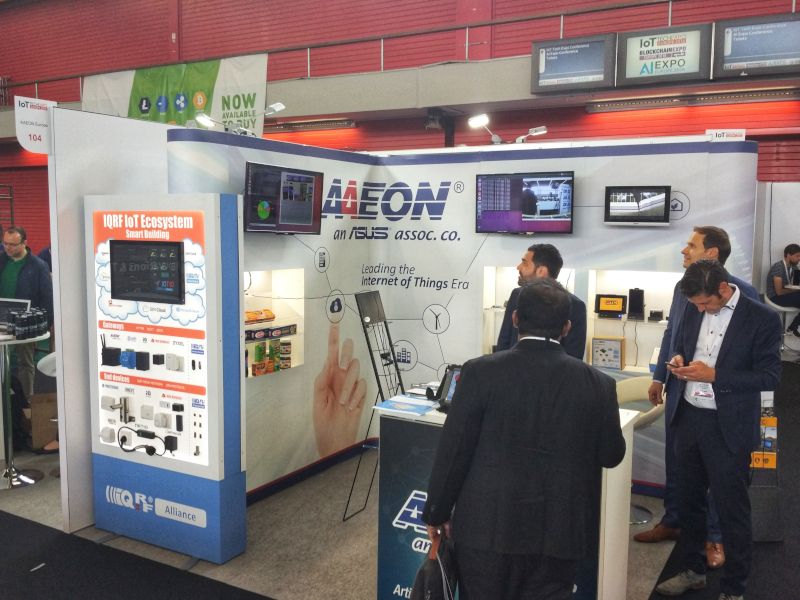 AAEON Europe, the member of the IQRF Alliance, was one of these exhibitors and kindly invited the IQRF Alliance to represent members’ products with the live demo board at their booth. Visitors indeed enjoyed the live demo. It was one of the few real portfolios of products among thousands of promises all around. Interested visitors could try to remotely control the smart power socket by Netio or to breath on the carbon dioxide sensor by Protronix and watch how their breath is changing the data visualized in Node-RED based UI made by JOTIO. The whole demo was running on AAEON’s UP2 board PC powerful enough to be a gateway of the IQRF network and also run the Ubilinux with data visualization on a local server. Moreover, Rens Wouters from AAEON was one of the speakers and presented about Artificial Intelligence in front of a full hall. Every year competition organized by the company MICRORISC has finished and knows its winners from high technical schools. 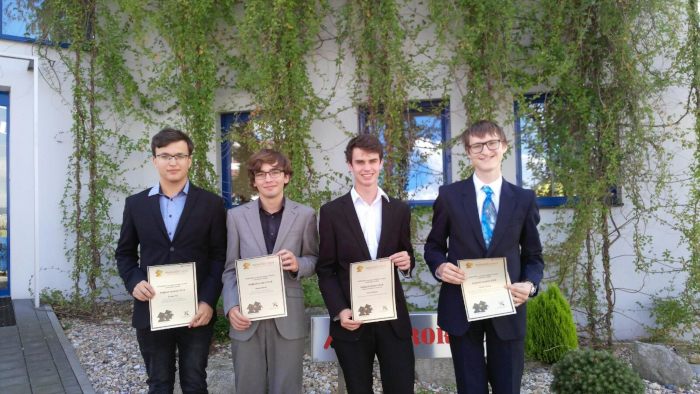 The final round of the 8th “The Best Student” competition was held at the headquarters of MICRORISC, on June 20, 2018. The expert jury selected the finalists according to their excellence, abilities and other activities. During the finals, students had the opportunity to present their interests, achievements and free-time activities. Finally, the three best students were rewarded with CZK 5,000. Because MICRORISC operates on the market with modern technology, the fourth student was awarded as the best technician. The prize was also prepared for the best school that became Usti nad Labem Grammar School and which won CZK 10,000. MICRORISC organizes this competition to support and motivate secondary school students in their education and active attitude to life. This entry was posted in General on 22.6.2018 by Jan Pešl. IQRF is usable almost with any equipment and almost in any application where low speed and low data volume wireless is needed, ranging tens or hundreds of meters (up to several kilometers in special cases or in networks), either simple peer-to-peer(for just two or a few devices) as well as in huge complex networks (up to hundreds or even thousands of devices). No infrastructure is needed. IQRF can be used by almost anyone, from garage hobbyists to hi-tech giants. But it is primarily intended for manufacturers. Worldwide interoperability of products with IQRF inside is ensured by IQRF Alliance. Packet oriented communication. E.g. a 64 B payload data packet can be sent in about 40 ms to another device in range. Hopping to end point out of direct range via other (up to 239) network nodes is possible (with corresponding delay). Low power consumption enables battery operated devices with lifetime of number of years. Outstanding 15 µA while receiving (in consumption optimized XLP mode). Even better is 330 µA while receiving combined with 380 nA while precisely timed sleeping. Mesh networks (with redundant paths providing reliable throughput). Semistatic topology. The most user-friendly (fully automated) networking algorithm requires fixed (not moving) routing devices. End devices are fully relocatable. However, topologies with all devices moving are also possible. Control applications where end devices are managed and monitored from a central point. Telemetry – data collection from end devices (sensors etc.). Acquired data can transparently be forwarded to Internet and stored in Cloud depository accessible from anywhere. End devices in the network can also be managed remotely via the cloud. Intelligent buildings and cities. One of the most successful IQRF field is lighting and especially street lighting. IQRF is suitable in almost all thinkable branches indeed, even in a lot of not expected ones. Selection from existing projects: catfish attractor, deer detractor, big cats safeguard for a zoo and data (temperature, pH and redox potential) measured via the IQRF sensor put in the cow’s stomach. Long distances (1 kilometer order of magnitude, per hop, typically). However, with precise directional antennas arrangement, even several kilometers per hop are possible. Devices providing very simple tasks (unidirectional etc. ), e.g. car door openers, to be produced in high volumes (unless being a part of a higher smart system). But, if you prefer the shortest development time, IQRF is suitable even for the simplest tasks. However, it is easily possible to interconnect these (and other) standards with IQRF (often via IQRF plug-and-play gateways). Moreover, IQRF is easily connectable to almost any computational equipment, either full-featured computers, tablets etc. or to small intelligent embedded devices (Raspberry Pi, chipKIT, PlugPC, Arduino, BeagleBone, …) as well as to standalone MCUs. IQRF SDK open source SW package is available for devices programmable in C, C++, Python or Java. This entry was posted in General on 8.6.2018 by Jan Pešl.